Your Attitude is Everything! A Warrior's Attitude is: Failure is Not an Option! An attitude of total commitment and passion for what it is that they're doing is one of the most important traits of any successful person. They set about doing what is necessary to attain that goal. This is something that has been repeated in uncountable books on success, the "winner's attitude," and personal achievement as-well-as throughout our leadership and life-skills curriculum. I have written and re-written about it - I have spoken and reiterated my points again and again in classes, seminars, and lectures. But still I see my students, clients, and others that I care about settling for average results and the unfortunate habit of excuse-making. I think it has to do with the lessons of those who came before us. I believe that it's due to our pre-programmed need to have a 'back-up' plan should we not succeed. ...why then would we need a plan of action should we not succeed?! Now, I'm not being funny, or mean, or unrealistic. If we don't succeed at what? Lack of experience, knowledge or resources? ...designing something into the equation that will make it acceptable to fail. I don't mean that we necessarily set out to fail, just that we provide an excuse before we need one. Our attitude toward success and our goal is all wrong. My son has a goal to enlist in the Navy. He is doing this to gain both knowledge and experience for a future job with a major airline as an aircraft engine mechanic. He has set up the necessary interviews, obtained the requirements for enlistment as-well as those for getting the job that he's after. Unfortunately, he's overweight and as a result, will have to lose weight or, at the very least, get to a point where his measurements meet the minimum standards. He has set one date after another for the enlistment, but has not lost enough by each date to qualify for enlistment. A friend of his, someone who is very concerned for his welfare has suggested heavily that he start looking for an apartment, as-well-as gathering information about car insurance, etc., just in case he doesn't meet his latest goal. The idea being that he will have a back-up plan should he not "make it." ...to move out on his own? While both would accomplish the later, this is not the goal. And the so-called back-up plan does not contribute to the attainment of my son's primary goal. Nor does it take into account the driving force - his attitude - towards having set the goal in the first place. In this scenario, failure - not attaining the desired goal - has been wired into the equation. ...to make sure that any such plans contribute to the accomplishment of the goal. This is more aptly called a 'contingency plan.' Why was he not able to enlist by those other dates? Setting an unrealistic time to accomplish the task? Not carrying through on what needed to be done? Was his goal not based on a heart-felt positive attitude of how great it will be to work in such a field - to be looked up to - to be respected as being more than a mere mechanic of smaller engines? These are questions that a contingency plan, or plans, will handle. Giving himself a worse-case alternative as an incentive to achieving the goal, etc. Engaging in exercises and mental drills that focus his mind on all of the positive benefits of achieving the goal, or, conversely, focusing on the pain and discontent of "not making it (also a VERY positive motivator!). The idea here is that we need to clearly understand the goal and what we want to get. Ot attitude here will make all the difference in the world. ...failure is never an option! Jeffrey M. Miller is the founder and master instructor of Warrior Concepts International. 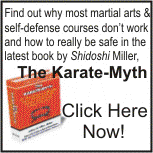 He specializes in teaching the ancient ways of self-protection and personal development lessons in a way that is easily understood and put to use by modern Western students, groups, and corporate clients. (570) 988-2228 or contact him using this convenient form.